Key stat: Since 2000, there have been only six cornerbacks drafted in Round 1 who were 6-foot or shorter, weighed 200 pounds or less and who ran a 40-yard dash at the NFL scouting combine slower than 4.5 seconds. 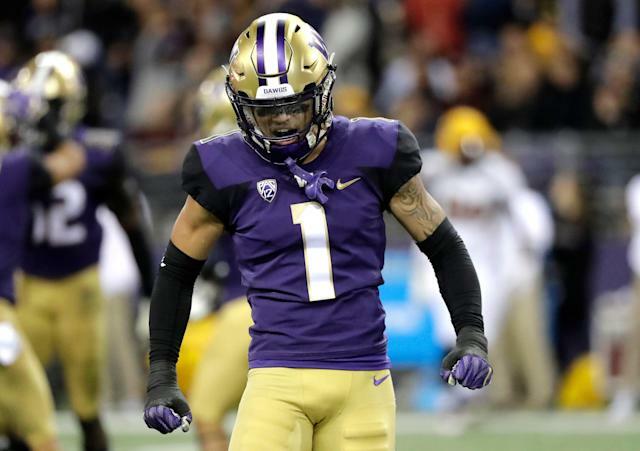 The skinny: Murphy was a two-way star in high school and a top-50 Rivals recruit who signed with the Huskies and spent his freshman year redshirting in 2016, when he was named the team’s Defensive Scout Player of the Year. After winning a starting job as a redshirt freshman in 2017, Murphy started the Huskies’ first three games before suffering a broken foot in practice that cost him seven games in the middle of the season. He returned for the stretch run and had big performances against rival Washington State (five tackles, including one for loss, fumble forced, three passes defended) and Penn State in the Fiesta Bowl (seven tackles, including two for loss, one sack and an interception in the end zone). Upside: Terrific production in small sample size — averaged 1.35 passes defended per game and 0.45 turnover-worthy plays (INTs and forced fumbles). Came through in big moments — played some of his best ball down the stretch the past two years. Murphy’s pick-6 vs. Utah in the Pac-12 championship game was the game’s only touchdown. It helped send Washington to the Rose Bowl. Performed well in games with NFL-caliber receivers (Auburn, Stanford, Arizona State, Ohio State, e.g.). Plucks the ball like a wide receiver. Times passes up, high-points well (despite a lack of length) and gets in good position to make a play. Baits quarterbacks to throw his direction with just enough cushion. Field-fast – plays faster than his timed speeds. Extremely fluid, quick and natural — no wasted movement. Was by far the best corner at the combine in the positional drills, “the best in years” one evaluator told Yahoo Sports’ Charles Robinson. Has inside-outside versatility. Elite instincts for the position allows Murphy to shadow receivers, even from off-man coverage, and close fast on the ball to make a play. Good route awareness and knows when to take a chance. Gambler but not reckless. Insane ability to poke out balls from receivers’ hands without interference — one penalty against him in four games we charted. Takes to coaching and has made big strides in three years under noted Huskies assistant Jimmy Lake, one of the best DB gurus in college football. Strong pedigree from DB factory in recent years — Washington has produced four top-50 picks at corner and safety since 2015. Plays big, too. Fearless and aggressive in attacking the run — not afraid of mixing it up. Can deliver a message when he hits. Gets the most out of his smaller frame — nicely conditioned with good musculature, plus room for a little added strength development. Very loose hips — not tightly wound at all. Flips and turns in a hiccup. Can plant and drive with flexible ankles and good short-area burst. Breaks downhill in a jiffy to close down routes. Keeps eyes on QB — looks through receivers to the ball. Combination of physicality, fluidity and instincts is hard to find — a rare trio. Downside: Limited body of work — only 1.5-year starter and total of 20 college games. Pedestrian combine and pro day workout numbers. Ran a 4.15-second short shuttle, 6.83-second 3-cone drill and an 11.25-second 60-yard shuttle at pro day — all fine but hardly eye-popping. Average height, lean frame, thin hips, small hands and very short arms. Lacks the body armor that you want and could carry durability concerns. Missed seven games as redshirt freshman. Can he play slot in the NFL? Limited work inside and might need time to develop proper feel for the spot if he’s tried there. Lacks elite deep speed to stick with fast receivers on vertical routes in straight man to man. Can get a little risky in his play — dares QBs to throw his way, and it sometimes comes back to bite him. Gets flat-footed at top of receivers’ stems occasionally. Had a few interceptions fall right into his lap, including the game-winner in the Pac-12 title game. Savvy receivers might get good releases unless Murphy learns to use his hands better. Plays off and gives too much cushion at times. Will be hard-pressed to be a press-man corner with only average strength and short wingspan. Could be taxed to stop 50-50 balls with same regularity in NFL. Will dive at ankles and whiff on some tackles – needs to come with better angles and raise his target zone up. Best-suited destination: We think Murphy could develop into one of the 10 or 15 best outside corners in football with proper development, but he also has the ability to transition into being a slot corner as well. Some teams might peg him there from the outset because of his size, but Murphy holds up well on the perimeter and would be an excellent addition to a heavy zone/press-bail team that needs a playmaker who can tackle. Among the teams that could be especially interested in his services include Oakland Raiders, Pittsburgh Steelers, Tampa Bay Buccaneers, Carolina Panthers, Arizona Cardinals, Los Angeles Rams, Miami Dolphins, Buffalo Bills, Detroit Lions, Washington Redskins, Seattle Seahawks and Houston Texans. Fact: Murphy’s first love growing up was basketball, and it’s no shock considering his uncle is former NBA point guard Mike Bibby. They remain very close, but Murphy also is tight with his former high-school football teammate, N’Keal Harry. Both players lined up at receiver for Chandler (Ariz.) High School, but in their senior season together it was Murphy (88-1,733-21) who put up bigger receiving numbers than Harry (48-802-7), who is expected to be a top-40 pick as a wideout this spring. Murphy also did a good job covering Harry this past season, helping hold him to five catches for 20 yards.